All of us who check the Forum with any regularity run into “help request” postings that assume a variety of forms, from a student reaching to extend their project to the hopeful new user with a really big idea and no idea of how to start (and nearly everything in between). I expect that everyone can identify with both of them, upon a moment’s reflection. The arrival of the new search features in Max 8 will really change the game for new users - and more seasoned Max programmers, as well. One of the changes is a quick solution for the beginner who’s embarrassed to ask questions - Are you worried that you have a silly question? Using Max 8’s search before you post to the Forum may not only answer your question (and point to your next question, perhaps), but it will also help you feel more confident that your question might be less silly than you imagine or more complicated than it seemed. It may also help you to formulate your questions more clearly, and that almost always guarantees you better answers. 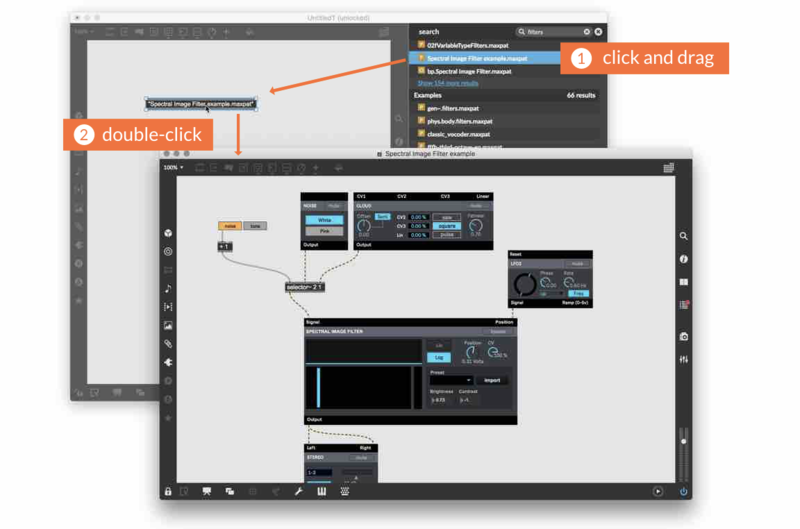 Over the years, one of the steady and subtle improvements in Max itself has been about discoverability - finding new ways in which Max could explain itself to you as you work with it, and finding new ways of informing or reminding you of the resources you already have at your disposal. Max 8’s new search features represent a real leap forward, and one that will be of use to both beginners and seasoned Max users. When it comes to the myriad blessings of Max 8’s search for more seasoned users, I’ll take myself as a case in point: When it first appeared, I decided to give the new Max search features a try as part of my patching practice - after all, if you don’t know how to do something in Max you’ve never tried before, you’re magically transformed into a beginning user. Not only were the searches and search rankings better, but they were broader (and they now included Max patches I'd saved in my search path, too) and I could make quicker use of what I found. 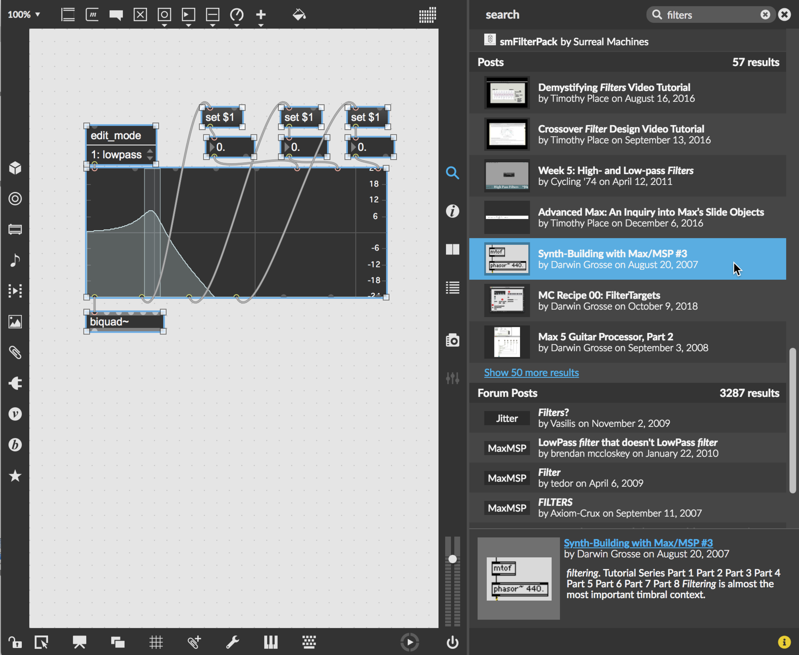 Simply put, the Max 8 search makes it a lot simpler and quicker to look at what’s out there. It provides a wealth of investigatory options to the curious, and does so in a way that suggests there are a number of different ways to achieve your end. And by including web content, it begins to do something that I believe is subtle and important - it begins to bridge the gap between Max as a collection of lots of individual objects and the ways they’re used by various user communities to solve problems in Max. 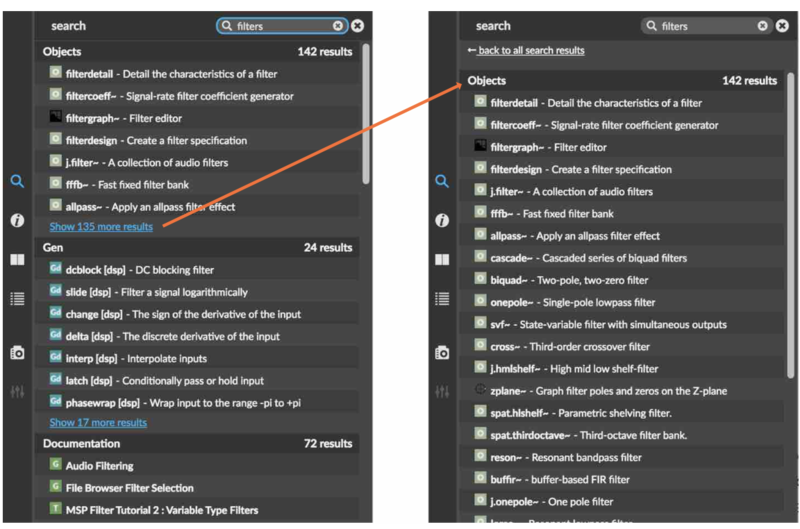 What makes the new search system in Max special is what it combines - it synthesizes the help and reference materials you’ve always used with information from the Max application’s internal database which includes everything in your Max search path - Max packages, a dizzying array of example patches, and all of the Max patches you’ve created yourself [if they’re in your search path]. Since the results are sorted by relevance and grouped by type, you can quickly move back and forth from help files to example patches to tutorials as you look around. Want to drill down into the results you get? Just click on "Show more results"
And - for me anyway - the act of looking around at my options has been the place where I encountered not only the solutions I was searching for, but also new ways of doing things that had little to do with my initial question. When I look back at my initial experience with learning to use Max, I realize in retrospect that what really changed things for me was a gradual shift in my problem-solving approach from asking for solutions to asking for advice about how to approach a problem. The new Max 8 search makes it more likely that new users will encounter this instructive dilemma while providing different paths of inquiry for even the most seasoned user (Do you have any idea of how extensive and cool the Max examples are? I sure didn’t….). Checking individual search results is a double-click or a click-and-drag away. 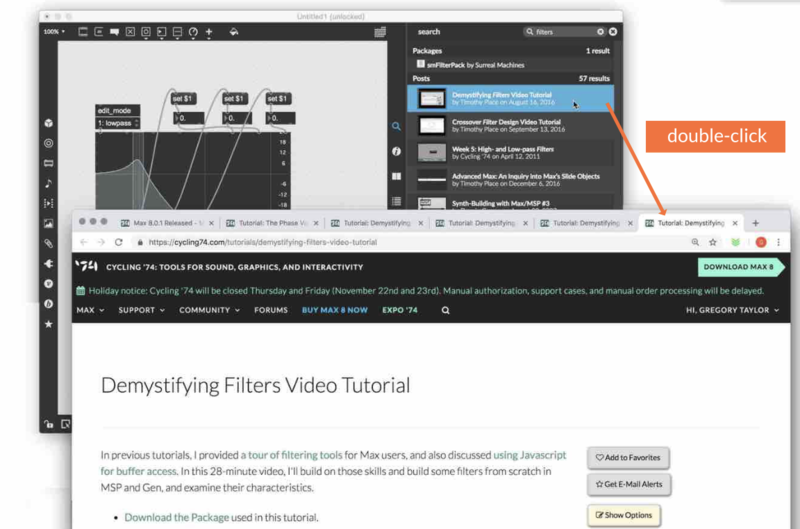 Want to check out a tutorial, a ref page, an online Article, a Package, or a Forum posting? Just double-click on a result and you’ll be shown what you’re looking for. Investigating Max objects or Gen operators puts you a double-click away from a refpage or helpfile. 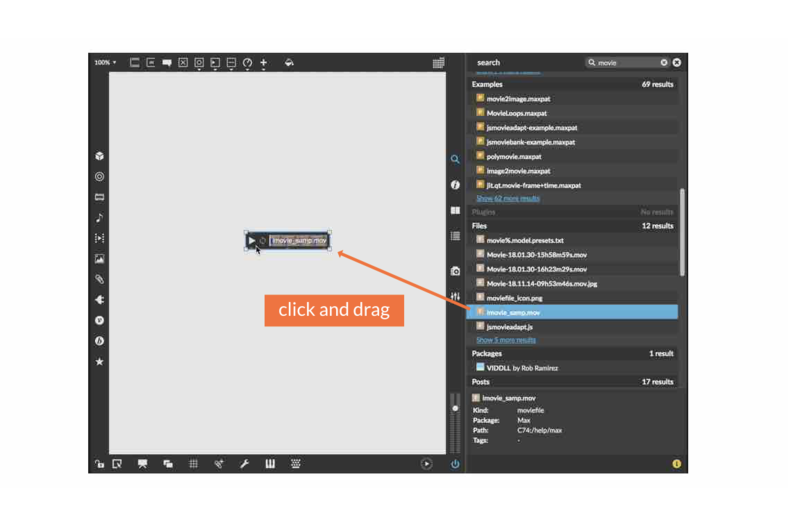 When it comes to one of the many examples that come with Max, opening the patch is also a double-click away, or you can drag and drop patchers or snippets into your patcher window to create a subpatcher that contains that content. Note: You can also use drag-and-drop when hunting for movies, audio files, or still images, too – clicking and dragging a movie or audio file to your patcher window will create a playlist~ or jit.playlist object with your audio or movie loaded and ready to go. Have I become something of a Max 8 search evangelist? I guess I have. Go on - give it a try - I'll bet that you'll be joining me.